I probably don't have to remind you about how much I love soup. And through my frequent posts about it, you can tell it's a staple in our household. While perusing through the latest issue of Food Network magazine, I noticed a little insert about "50 Things to Make with Pesto." A huge lover of this food, I was all over it and stopped immediately when I saw an enticing picture of a pesto bean soup. Long story short, I made it this week and it turned out fantastic. Not only does it cook fast, it tastes even better after resting a few days in the fridge. The flavors meld together to create the most comforting, fragrant mixture. Two surprising elements in this soup are roasted red peppers (I used red and yellow) and green olives. I must admit that before these two embellishments were added, the soup's flavors didn't pop as much as after adding them - it really made every other ingredient in the soup sing. Dan and I paired it with a crusty piece of bread, and there we had it, a filling, delicious and healthy dinner in less than an hour. YUMMY! 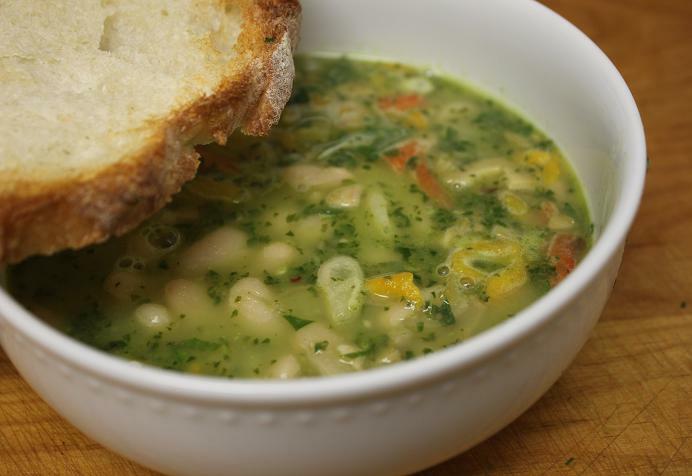 Here's the recipe for the pesto bean soup - take a look at #46 and #47. It couldn't be simpler.